Detail, digitally altered images from the film Schindler's List - images of the liberated Schindler Jews combined with an image of the aftermath of a suicide bombing in Jerusalem. Cultural and memorial projects often present the end of the Holocaust and the creation of the state of Israel in a narrative of liberation and redemption. 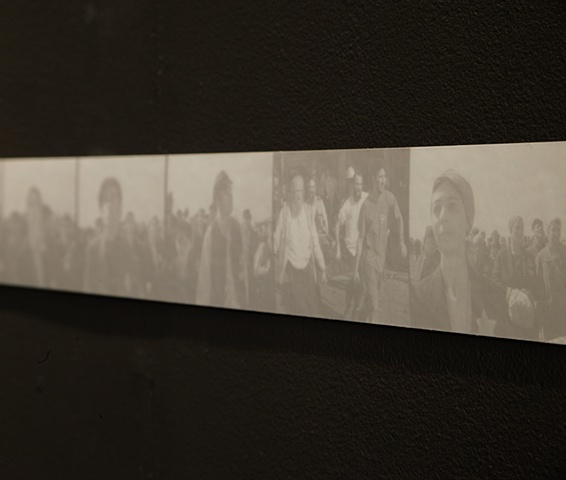 This work seeks to critically examine the impact of such events  albeit in vastly different ways  on both Jews and Palestinians, by disrupting this narrative arc as depicted for example in the film Schindler's List and Holocaust memorial museums.